Engineers in the industry now have a way to pursue data analytics, even without a background in statistics, mathematics or IT, all thanks to MathWorks. Data continues to be a driver for business. Predictive analytics and deep learning are now the leading trends; the possibilities and applications are wide-ranging. Naturally, there’s a mammoth demand for data scientists. IBM predicts the need for data scientists will soar 28 percent by 2020. Annual demand for new roles of data scientist, data developers, and data engineers will reach nearly 700,000 openings by 2020. However, engineers and domain specialists who are now working in various industries such as aerospace, defence and automotive did not have the benefit of learning data science and analytics when they graduated. Big Data analytics has been included in academic curriculum only recently. There is no time to train today’s scientists and engineers who are already working in their respective fields. For instance, an expert in Aerospace Engineering did not learn data science as a subject when he graduated. However, he knows that there are a lot of applications in data science for aerospace engineering. Model-Based Design is one of those applications; some examples are stated later in this story. So how does an engineer ramp up to be a data scientist in the aerospace domain, for instance? There is a way to bridge the gap. The community of scientists and engineers have long been using MATLAB, a language or platform for technical computing. 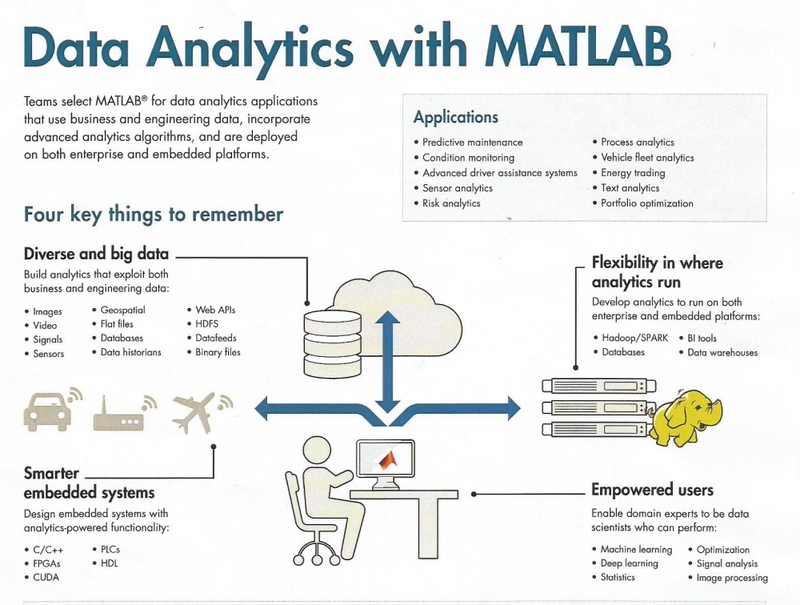 Developed by the US-based MathWorks, MATLAB has evolved to become a platform for data analytics. It enables engineers in various domains to build applications for business analytics or engineering analytics. MathWorks, founded in 1984 and headquartered in Massachusetts, USA, has become an industry standard for engineering and science. Its major platform products include MATLAB and Simulink, which support data analysis and simulation. Simulink is a platform for model-based design. It is a simulation engine which is used to model various physical systems for dynamic embedded systems, whether it is dynamic embedded controls or signal processing applications. With MATLAB at the base, Simulink works on top of it. Simulink offers various solvers that help engineers simulate their systems. For instance, it can model a physical DC motor (digital twin) and an engineer can use Simulink to design a control algorithm to control the DC motor. The engineer can run simulations on his desktop and check the control algorithm in terms of how it would behave with a real DC motor. Engineers can model the complete logic of their control and can model the algorithms. These are standard tools used by the industry for many years. Simulink is used for developing signal processing algorithms. It is largely used by engineers and scientists working in application areas of modelling physical systems or signal processing systems or communication systems. “Within this community of engineers and scientists, our tools are used by automotive, aerospace & defence industries. We also have industries like industrial automation, communication electronics, semiconductor, finance (our tool are used to build financial models),” informed Motwani. There are numerous examples of how engineers in various industries are using the MathWork platform and its tools. Here are two examples. Engineers at National Aerospace Laboratories (NAL), for instance, have realised the benefits of model-based design using MathWorks tools for DO-178B Flight Software Development. “Simulink and Model-Based Design reduced the effort needed to upgrade functionality, code analysis time, and design time for the safety-critical embedded system. The compatibility of Simulink with the DO-178 process gave us confidence to use Model-Based Design for our upcoming DO-178 projects,” said Manju Nanda, National Aerospace Laboratories. NAL is the only government aerospace R&D laboratory in India’s civilian sector. CSIR-NAL (Council of Scientific and Industrial Research) developed SARAS, a 14-seat, multirole light transport aircraft. SARAS is equipped with a state-of-the-art stall warning system and aircraft interface computer (SWS/AIC) that alerts pilots when the plane is in danger of stalling. Recently, CSIR-NAL engineers completed a SWS/AIC pilot project in which they quantified the advantages of Model-Based Design over their conventional approach for DO-178B Level A software development. Among other benefits, they found that Model-Based Design with MATLAB and Simulink reduced the effort needed to upgrade functionality by 75 percent. Another example is Scania, a leading global manufacturer of heavy trucks, buses, coaches, and industrial and marine engines. Scania developed a fuel-saving driver support system using MathWorks tools for Model-Based Design. Inefficient driving techniques can increase carbon emissions and raise fuel consumption by as much as 10 percent. To address this, Scania developed a real-time driver analysis system that provides truck drivers with immediate feedback on their driving techniques. To keep development costs down, Scania engineers used MATLAB, Simulink, MATLAB Compiler, and Real-Time Workshop Embedded Coder to model and simulate the driver support system, develop a prototype user interface, and generate embedded code for prototype and production targets. The resulting system provides immediate feedback to drivers. “Simulink is particularly helpful in two stages of our development process. Early on, it helps us try new ideas and visualise how they will work. After generating code and conducting in-vehicle tests, we can run multiple simulations, refine the design, and regenerate code for the next iteration,” said Jonny Andersson, Development Engineer, Scania. Employing Model-Based Design helped Scania complete development ahead of schedule. Since its debut in September 2009, the system has improved driving techniques, leading to safer driving, less wear and tear on brakes and other parts, and lower fuel consumption. The real reason for the wide acceptance and popularity of MathWorks is the industry-specific Toolboxes that it offers. MathWorks provides a range of toolboxes that work with its two base products, MATLAB and Simulink. In fact, there more than 80 toolboxes, updated twice a year. For those working in Mathematics, there are tools like partial differential equation toolbox, curve fitting toolbox; a large part of MathWorks’ data analytics application is built using the statistics and machine learning toolbox. There is a neural network toolbox for people working on deep learning technologies. A curve fitting optimisation toolbox is available for people working on process optimisation. There is a toolbox that helps engineers and scientist explore those algorithms for their optimisation problems. There is also a toolbox for financial modelling. Apart from industry, MathWorks tools and applications are also widely used in universities across the world. MathWorks offers a campus-wide license so that all students and teachers in a university have access to its tools. Campus-wide access to MATLAB provides a common platform for teaching, research, and student projects across all fields of engineering, physical and social sciences, and finance. A campus license has become a competitive advantage for universities. Hundreds of universities have upgraded their MATLAB access to a Total Academic Headcount license. This includes 24 of the 25 top-ranked technical universities and 76 of the top 100. In April 2012, Manipal Institute of Technology (MIT) in Karnataka became the first Indian university to implement a campus-wide license for the MATLAB and Simulink product families. With this implementation, MIT has standardised on the same tools used by engineers and scientists across industries for technical computing, simulation and Model-Based Design. MIT’s students will gain hands-on, practical experience with software used widely in industry, and MIT’s faculty can engage in research and devise curriculum based on their experiences with these tools. MIT has been using MATLAB and Simulink in its B. Tech and M. Tech courses since 2003, and has integrated the software into its curriculum. With the new campus-wide implementation, more than 2,000 undergraduate and post-graduate students, and over 500 faculty members can learn, teach and research with MATLAB and Simulink in MIT’s labs, classrooms, and on laptops and PCs off-campus. The implementation covers wide-ranging disciplines such as Engineering, Biological and Life Sciences, Mathematics, Physical Sciences, and Business and Economics. Students use MathWorks tools not only in their courses and research, but also to get a real-world perspective to the theories they learn. There are engineering courses, curriculum and books on MATLAB. MathWorks also has a community of two million plus users, called MATLAB Central. Community members, including students, scientists and industry engineers, develop very specific functions and applications that work with MATLAB. Community members share applications and help solve problems for those working in industry and academia. All that’s needed to run a community application is a runtime version of MATLAB on the desktop. MathWorks has long recognised the tremendous potential of data analytics. It created a set of tools that enable industry specialist to harness their data through applications like model-based design. Using its industry-specific toolboxes, an engineer in a certain industry can quickly use data analytics. MathWorks is also helping to bridge the demand-supply gap through its initiatives in academia, notably the campus-wide licenses and curriculum. “Data analytics is a major market trend. It is a major opportunity for us, and we have significant capabilities in our tools which will help engineers and scientists build both engineering and analytics using our tools. We will keep adding capabilities to our tools to cater to the upcoming needs of the market,” said Motwani of MathWorks. MathWorks also organises industry events that focus on big data analytics and deep learning. “Through such events, we address typical challenges that domain experts face when getting into the world of data science,” said Motwani.